A group calling itself Protect Elk Grove has produced and distributed a flyer received in mailboxes today targeting Elk Grove Mayor Gary Davis. 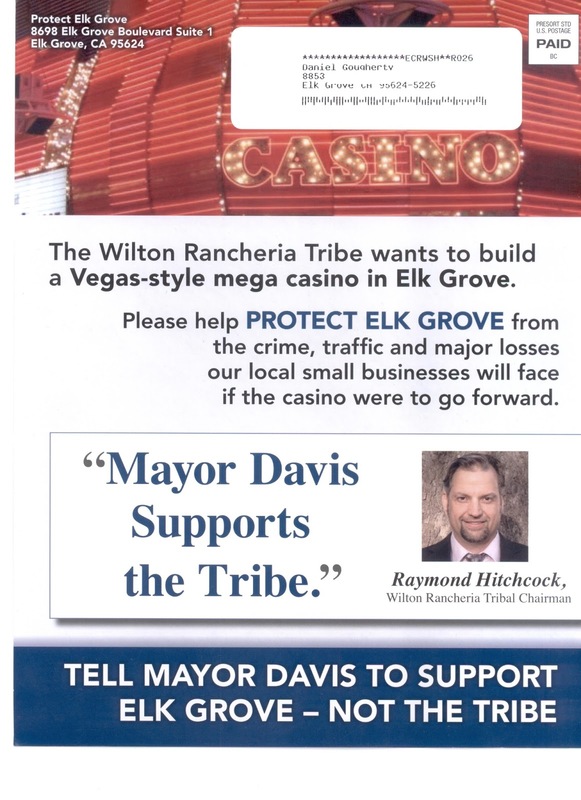 The glossy mailer, which includes quotes from Wilton Rancheria Chairman Raymond C. Hitchcock spoken during Wednesday night's information session hosted by the tribe, urges Elk Grove residents to tell Davis not to support the tribes proposed $400 million casino. The proposed casino would be located on a 35-acre portion of the parcel currently home to Howard Hughes Corporation's unfinished Outlet Collection at Elk Grove shopping center. Among other images included on the mailer are photographs suggesting increased criminal activity such as drunk driving and implied prostitution would result from the casino. The mailer asks "What will a Vegas Style Mega Casino Do to Our Community? More Crime More Traffic Devastate Local Businesses." The return address on the mailer for Protect Elk Grove lists 8698 Elk Grove Blvd., Suite 1, which is a UPS Store. A call to the number on the mailer and website reaches a recorded message. As of this posting, Protect Elk Grove has not returned calls seeking comment regarding further information about the group. 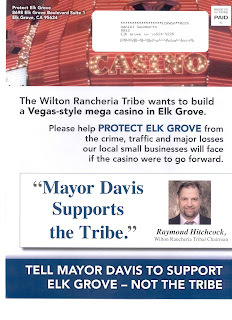 As noted on the mailer, during Wednesday night's meeting, Davis said that while he supports the tribe in general terms, he demurred on giving outright support for the casino. "At this point, I am not taking a position," he said to the audience. Davis, who is up for reelection this November, did not return a call requesting comment as of this posting. The mailer's call to action urges Elk Grove residents to contact Davis' assistant at a number listed on the piece. The number listed is not Davis' Chief of Staff Teresa Rodriguez, rather Elk Grove City Manager Laura Gill's assistant. The call to action says "Call the Mayor and tell him to stop cozying up the to the tribe. [sic] Demand the he [sic] takes action to PROTECT Elk Grove. Tell the mayor to use his power to STOP a Vegas-style casino from being built in Elk Grove." 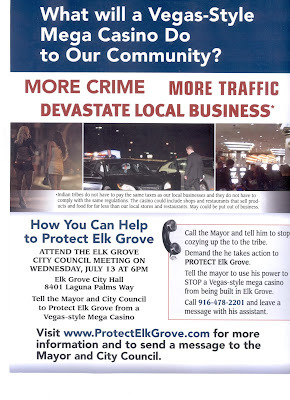 Additionally the mailer asks residents to attend this Wednesday night's Elk Grove City Council meeting and "tell the Mayor and City Council to Protect Elk Grove from a Vegas-style Mega Casino." During the information session held on Wednesday night, Davis said the casino would be on this week's city council agenda. However, when the agenda was posted yesterday afternoon, the matter was not included. Updated at 6:50 to include comments from Wilton Rancheria Chairman Raymond C. Hitchcock. This group appears to be hiding behind a proxy server from Scottsdale according to Whois. The flyer appears to use smokescreen fear tactics of crime and traffic then goes into detail about unfair business advantages of the casino. To be honest, as a consumer, don't we benefit from business competition? Whoever they are, they are ignorant of the process. Gary Davis has no influence on a sovereign nation. The feds decide whether they get a gaming license and the best the city can do is kneel at the tribe's feet and try to pick up the crumbs the tribe drops as payment to offset their impacts. Well actually that is not always the case. Litigation on the Casino in Ione which went on for 11 years was eventually transferred to Federal Court in California. There are many factions as stated in the article that can be mitigated with the tribe...you don't have to just pick up the crumbs, so to speak! I just noticed that at the bottom of the flyer you can Visit the website and leave a message for the Mayor and City Council. Each citizen needs to write a letter to the Federal bureau of Indian Affairs and to Governor Brown stating they do not want the casino in Elk Grove. State your reasons and be specific. Keep your opinions to your current residence. Yours truly, East of 99 Elk Grove resident of 32 years. I lived in Sheldon for 35 ye as rs until recently. I still care what happens to the city. *clap* *clap* *clap* You must have quite a lot of time on your hands to be the saviour we didn't ask for. Why not volunteer at your local soup kitchen and leave town matters to townsfolk? There is a lot of people that still lives here in E.G.and have for over 45 years. We support the Casino and the development around that area. Some of us that has lived here for over 45 years support the Casino and the development around the grantline/99 west area.